I picked this book because of the beautiful cover and for once the inside lived up to the cover art! Mistress of Winds is a story about a man, Bjorn, cursed to be a bear and find his love before a year runs out. If he fails, he must marry the troll queen’s daughter. I expected the other half of the equation, the love, in the form of Astrid, to be a weak character. Nothing could be further from the truth. Astrid carries the show. She is strong, inquisitive, and not about to take anyone words at face value. Soon she discovers she has power in her own right. Half the fun of this book was looking for all the references to myth and fairy tale. The author added great twists to many old folklores. I spotted parts of the Cupid and Psyche myth and The Brown Bear of Norway, all done in a fresh and exciting new way. It held my interest all the way through. There was warning that this story wasn’t for younger readers. 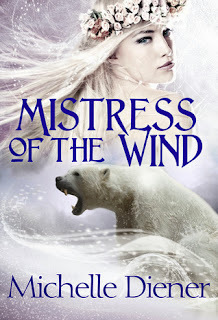 This warning worried me because I don’t care for books with graphic passages, but there was only one short scene of that kind in Mistress of Winds and it was very inoffensive. This is one of the best books I’ve received from Net Galley, I’d highly recommend it. This sounds like a good book to add to my 2014 reading list; thanks for the recommendation!